It’s been a hugely controversial week in New York. End of an era: Ben McAdoo, right, and Eli Manning. NEW YORK GIANTS head coach Ben McAdoo insisted he has no regrets about how the benching of quarterback Eli Manning was handled and he is “on the same page” as team co-owner John Mara. McAdoo controversially ended Manning’s streak of 210 consecutive regular-season starts but naming the 36-year-old on the bench for Sunday’s NFL showdown with the Oakland Raiders. McAdoo said on Tuesday the plan was to start Manning in the matchup with the Raiders and replace him with Geno Smith for the second half. Manning was not interested in the plan McAdoo put forward and suggested Smith should just start the game. “I’m confident and comfortable with our lines of communication,” McAdoo said of Mara. While McAdoo is taking serious heat for benching Manning, he said the decision was made with the best interests of the 2-9 Giants in mind. Email “Giants boss McAdoo: No regrets about Eli Manning benching”. 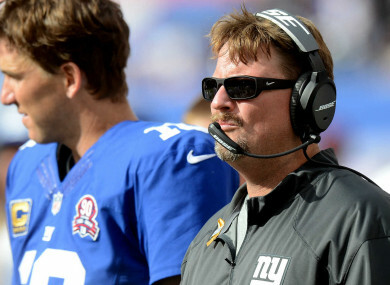 Feedback on “Giants boss McAdoo: No regrets about Eli Manning benching”.